Newly designed Lower Unit Fill/Drain Kit comes with all the necessary components to convert your existing drive unit. It allows the customer to perform quick conditional checks to ensure the Lubricant has not become contaminated. It also allows a cleaner means to purge and replace the existing lubricant without the inherent risk of spills. The exposed components are manufactured using marine grade stainless steel throughout to ensure the longest possible service life. The adapters feature a spring assisted check valve to prevent leaks while allowing the customer ease of access to check the condition of the lubricant. The lower adapter is equipped with a magnet to help prevent failure by securing metal particles that may contaminate the lubricant. Installs in place of your existing lower unit drain and vent plugs. Stainless steel debris cap secures into the lower adapter to ensure the opening does not become blocked in the event of an impact. It is easily removed using the included tool that affixes to a keyring. 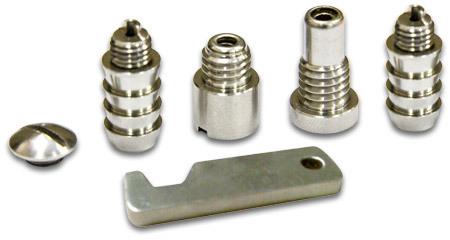 The service adapters are barbed on the end, which allows the customer to affix a hose and direct it into an appropriate container or for connection to an evacuator. Attach the tool to your keychain so it is always available. Tool is used to install the adapters as well as the debris cap. One end is machined to engage the check valve for a quick no mess sample for visual inspection of the lubricant.